This Credenza does NOT include a Wine Refrigerator. 2 spacious storage areas with sliding pocket glass doors, adjustable shelves, and room for our small under cabinet stemware rack. * Stemware rack sold separately. Included screws are to long for use on the Siena, please use shorter screws. Is this a back exhaust? How far from the wall does it need to be? Do the 2 wine refrigerators come with it? BEST ANSWER: I have this credenza with two wine refrigerators. If you leave the plywood backs off and allow about 6 inches from the wall, that should suffice for air circulation. Yes, the refrigerators come with it. This does not specify how far from the wall it has to be. Can the Siena Wine Credenza be purchased without a refrigerator unit? BEST ANSWER: Yes. I think so. Sometimes they run a special that might save you a $100 or so if you include the refrigeration unit but the base pricing only includes both ends open, with pocket doors, and adjustable shelving for each end. Yes it can it actually comes with shelves instead of the refrigerators. Yes it can. The item number is 3350101. Yes, fridge is optional. Its a nice piece. Yes but now we're looking for one! I may have missed it in the "Specifications" but do the shelves in the two 28 bottle refrigerators roll out to access the bottles? The shelves will slide out to access the wine bottles. Yes the shelves do pull out of the refrigerators. Are the shelves in the refrigerators adjustable so that other beverages, such as beer or soda, may be stored? BEST ANSWER: Thank you for your question, shelves on the 28 Bottle wine cellar can be removed to accommodate different formatted bottles, they are not adjustable up or down in height. Wondering how much heat is coming off the back of the unit; if it would be able to be backed up to a sofa and used similar to a sofa table? BEST ANSWER: This would not be a customary use. The back is best situated against a wall as shown. This credenza requires a 2" clearance for ventilation and would be best on a wall. BEST ANSWER: The 75"W Siena Wine Credenza - Nero, Item #335 90 04, and the 52"W Siena Mezzo Wine Credenza, Item #335 93 05, come with the 28 Bottle Touchscreen Wine Refrigerator that measures 29-1/4" H x 18-1/4" W x 21-1/4" D. The interior measurements on the refrigerator compartments are approximately 31-1/2" H x 20" W x 21" D.
Are the two wine refrigerators included with the credenza at the price of $2,694.90? BEST ANSWER: Yes the current price of 2,694.90 is for the Siena WIne Credenza with two 28 bottles. If you would like to order please call us at 1-800-377-3330. Yes. This version of the credenza includes two 28-Bottle Touchscreen Wine Refrigerators. Instead of the 3 rolling shelves for the wine, can i choose to have drawers for storage space? BEST ANSWER: Thank you for your inquiry. Unfortunately, the Siena is not availabe to be ordered with anything other than the rolling shelves in the center. If you have any further questions, feel free to reach out to us directly at 800 356 8466. Thank you again. This specific credenza is not available with drawers, you could modify it or order something different. Since the wine fridge only has a single control, is there a dual control fridge that will fit with this credenza? BEST ANSWER: Yes, the Wine Enthusiast Silent 24 Bottle Dual Zone Touchscreen Wine Refrigerator will fit as a dual-zone alternative. Thank you for your question, as stated below the 24 Bottle Dual Zone will work also in this application. Does it have dual controls so that I can keep reds and wine in the fridge at different temperatures? BEST ANSWER: Renee, the 28 bottle is a single zone unit for both red & white wines. Red & white wines both store at 55 degrees. They serve at different temperatures. This refrigerator has programmable controls. Is the back of this piece finished? I hope to place it against a stair railing, so it will be visible. BEST ANSWER: This Wine Credenza is made from tulip and walnut woods and is hand stained. The back is stained as well for a uniform appearance. The back of the wine cellar is finished in plywood. Does it come in an espresso color, or just black and walnut? BEST ANSWER: Thank you for your question. The Siena only comes in the Nero finish and Walnut finish. If you have other questions please call us at 800-377-3330. No, this does not come in an espresso color. Are the wine refrigerators sold separately, and if so, can one side be used for a beverage cooler, and the other a wine cooler? Do you stock a beverage cooler that will fit? BEST ANSWER: Thank you for your inquiry. Unforunately our Matrix beverage cooler would not fit inside of the Siena. The 24 and the 28 Silent Fridges to fit perfectly however. If you have any further questions, please feel free to reach out to us directly at 800 356 8466. Thank you again. Can the middle three drawers be reconfigured to hold wine glasses? The wooden roll out draws are built into the credenza therefore it cannot be reconfigured to hold wine glasses. Please feel free to contact one of our Wine Cellar Specialists @ 1-800-356-8466 to discuss options. 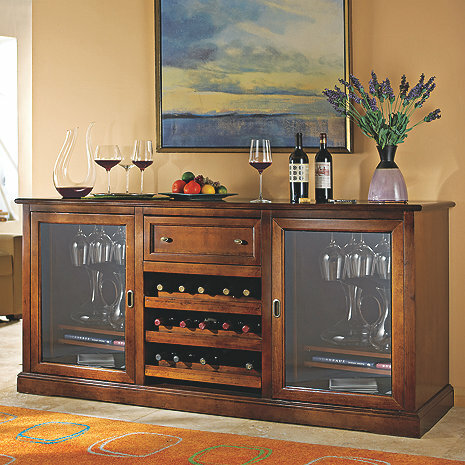 Will any of your dual-zone wine refrigerators fit in this credenza? Does the white glove shipping include installing the two 28-bottle wine coolers? BEST ANSWER: White Glove does not include installation of the 28 bottle units. By calling in and requesting, with certain agents, we at times can make that request for you. Can you send me a sample of the distressed gray finish on the Sienna Credenza and are custom finishes available? Sure we can. Please contact one of our Wine Cellar Specialists @ 1-800-356-8466 to request a sample. Instead of having two wine refrigerators and you have one as a wine refrigerator and the other for other beverages, such as beer or soda? speak directly with a storage consultant at 800-377-3330. Why is there not a notch or hole for the cord from the refrigerator on one side of the credenza? The cord can come of off the back of the cabinet when the panel is removed. Currently, that is the only way the credenza is set up. Can I request a specific date for white glove delivery? BEST ANSWER: You can request a specific date for a $100.00 time stop fee. If I purchase the Credenza without the fridge, will a 34' High, 23.875' Wide, 24' Deep, Sub Zero 424 fridge fit in one of the sections? That unit would be too high and may not have enough air clearance within the credenza. Please call one of Wine Cellar Specialists @ 1-800-356-8466 to discuss some other options. How much room in front on the credenza do you need to pull out the sliding doors to open them? I see in the specs that each wine refrigerator weighs 72 pounds but there's no spec for the credenza itself. How much does the Siena Wine Credenza weigh without the 2 refrigerators? Since the unit is hand stained, could we special order one with a cherry or chocolate cherry finish? Unfortunately at this time we do not offer special order stains other than walnut and nero finish. I just got my credenza and refrigerator today and it is beautiful. The web page talks about removing the rear panel for the refrigerator; however it appears to be one piece acorss the entire unit and removing it would make it open on the other side as well. The white glove delivery folks did not say it was necessary. Do I really need to remove it? If that is due to heat could I put some large holes in the back behind the regigerator unit instead? There should be 4 screws in each corner of the area directly behind where the wine refrigerator is located. While putting some holes in the panel may very well work lets see if we can get the panel off first. Please call one of our technicians @ 1-800-648-6058 (option 2) They will be able to assist. in 230 volts? What is the delivery time if ordered today? Is this unit available in 50 HZ? BEST ANSWER: This is only made in standard U.S. Voltage . If the credenza is in stock the transit time is approximately 10 to 15 business days. The shipper will call you directly to schedule a day and window of delivery. Are the refrigeration units quiet? BEST ANSWER: Thank you for your question, the wine cellars included with the Siena are from our Silent Series, therm o-electric. They are extremely quiet. The White Glove delivery method is the only way we ship this type of item. It ensures it arrives to you as it is supposed to. You are required to slide the cooler into the credenza yourself and remove the back panel to ensure proper air flow. Please contact one of our Wine Cellar Specialists @ 1-800-356-8466 if you have any further questions? What product do I use to clean the top of the nero color? Can this credenza be ordered without the refrigeration? Used for storage only? BEST ANSWER: Thank you for your question. Yes we can order this credenza without refrigeration. Please call us at 1-800-356-8466 to place an order. Exceptional value and service, now to fill it up. Waiting for the wine fridge being shipped separately. Had trouble buying through Bed Bath and beyond due to Calif restrictions on the wine fridge but The sales person at Wine Enthusiast found a solution and made it happen. Using the beverage refrigerator and find the cooling set at 39F is steady and wine and drinks cooled nicely. Many compliments on the furniture. Recommended! This took over five weeks to arrive but was worth the wait. It is a nice looking piece that is also useful. One of the two refrigerators came damaged, but Wine Enthusiasts ordered me a new one immediately and it should arrive in another week. Other than poor delivery communication, I am pleased with my purchase.